Essential (and free) Windows applications | " Xpert Bits "
Every time I build a new Windows computer, I install a dozen free applications for other people. These applications all seem to fill essential functions, and they all seem to be well-behaved installers and uninstallers. In other words, they won’t crash the computer or drag it down with gunk. Since they’ve served me so well, I thought I’d compile the list here and share them with you. Without spending a dime of your hard-earned money on software, you can now make the most of your computer. uTorrent is the BitTorrent client that is a must-have for anyone who wants an effective file-sharing application that can download large files. It was developed by a lone old-school programmer, Ludvig Strigeus, who wrote a BitTorrent client in a few hundred kilobytes (yes, that’s not a typo), which is a real pleasant surprise in this age of bloated Java applications with 100-MB memory footprints. It was bought out by BitTorrent Corporation, which raised some concerns among the user base. But the client has retained all of its functionality and the new owners have done a good job of maintaining it. 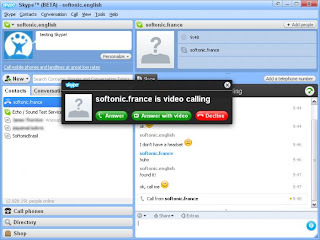 Skype is another killer app for the modern personal computer. If you haven’t already heard of it and installed it, go get it. It’s the first and one of the few VoIP applications on the market that "just works." Couple it with a good analog microphone or something like the Polycom Communicator, and you’ll be able to send superb wideband audio—which is a mazing compared to the normal narrowband audio you get on a telephone. If you add Whiteboard Meeting, which has a free limited version, you now have a mission critical business collaboration application. Add a Logitech Quickcam Pro 9000, Quickcam Pro for Notebooks, or Quickcam Orbit AF for as little at $80 for the first two models, and you have yourself a very high-quality 640×480 video conferencing solution. Skype’s HQ (High Quality) video conferencing is something you just have to see to believe. The only downside to the HQ mode is that Skype does not support IEEE 1394 camcorders, so you have to buy those Logitech webcams if you want the HQ mode. The camcorder support would have allowed much longer zoom for use in the living room, but unfortunately, it doesn’t have that feature yet. Also note that you need a minimal of 384 kbps uploads to maintain HQ mode. Paint.NET is just a nice free replacement for Windows Paint. It requ ires .NET Framework 2.0, but that’s included in Windows Vista. For a managed programming language, it’s not that bloated and loads relatively quickly. I would love to see RAW image file support, along with Lanczos3 image resizing algorithm, but they aren’t supported. That softens my enthusiasm for Paint.NET, but it’s still a simple image editing application that is very useful. If you don’t have a Nero (OEM or retail) for your CD or DVD bu rner or some other burner application, Infra recorder is a good free alternative. Not only that, it’s a lot less bloated and it has a small memory footprint. While Nero has some great functionality, it comes with too many applications and extra features that gunk up the system, though you don’t have to install them all. It won’t let you do simultaneous DVD or CD burning or other advanced things that Nero lets you do, but it does what it does well, and it’s a lot better than what comes with Windows XP or Vista. For those who want to take their movies on the go or back up their DVDs to a smaller format, Dr. Divx is an excellent free solution. Unlike the commercial Divx encode r (which I bought and can’t use), Dr. Divx actually works in Windows Vista. A really cool feature is the ability to handle .dvr-ms files, including HD footage from HDV cameras as input. The Divx output can be played in something like this $40 up-converting Philips DVD player on your TV set or it can be played back on any computer. The down side to Dr. Divx is that it is single threaded, which means it can’t take advantage of both CPU cores, nor can it take advantage of SSE4 on the new Intel 45nm processors, which can have a huge impact on performance. Hopefully this will be addressed in future versions. For now, I’m just happy that I finally found something to encode my .dvr-ms HD content. 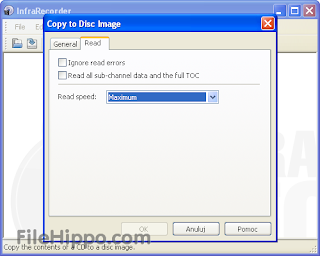 Note that you do need to download and install the Divx codec for Dr. Divx to work. FastStone Photo Resizer is an absolute killer application for anyo ne who deals with images. 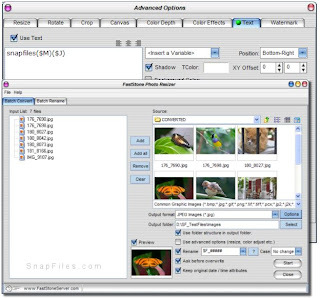 It can batch resize, rename, and convert images of all formats and sizes. Unlike Paint.NET, it does support Lanczos3 image resizing, which is a superior algorithm for maintaining as much image fidelity as possible. It installs simply and operates quickly. If you’ve ever taken a load of 2- to 4-MB digital images and you need to distribute them via e-mail or Web, you don’t want to spend hours uploading and making your family and friends mad when you make them wait for 100 MB of downloads. FastStone is the perfect mate for digital photographers and bloggers. The only criticism I have is that it doesn’t support RAW files as an image source. If you (or someone you know) is the kind of person who likes to d ownload videos (especially from questionable sources promising adult content) and you don’t want to end up with malware, K-Lite Mega Codec pack plus QuickTime Alternative is for you. This is CRITICAL security advice that everyone needs to know about. If you can’t play whatever you downloaded with K-Lite’s included codecs and QuickTime Alternative, trust me: DELETE that file immediately and DO NOT run it. Malware pushers will give you these video files that need special video codecs to play, or so they claim. You download those special codecs and install them, and I can assure you it is no longer your computer. 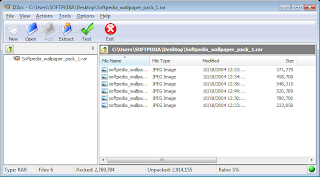 As good as the built-in CAB and ZIP utility is in Windows XP and Vista, it isn’t enough, because you need compatibility with all the other compression formats out there. IZArc will open any compression format under the sun and it’s free, unlike a lot of other utilities on the Internet. Get it, install it, and never worry about some compression format again. If you download something from BitTorrent that claims to be some special compression format and you need another one of those special utilities to open it, the safe bet is to delete that file because there is a good chance that the utility to decompress the file is malware. Don’t fall for it! CCleaner stands for Crap Cleaner. It is a great registry cleaner and temp file cleaner. (Note that the built-in Disk Cleanup utility in Windows XP and Vista will also do a lot of this.) I’ve used this application to clear out gigabytes of trash on PCs. It also has an excellent uninstaller, and you’d be surprised to see how much junk you can find with it. One note of caution: It does come bundled with Web toolbars, so be sure you uncheck that option if you don’t want them. Process Explorer is another essential tool from Sysinternals for diagnosing computer problems and finding potential malware on your computer. It shows you exactly what’s going on in your computer in an easy-to-read tree view. Most people who read my blogs know that I am not a fan of antivirus. To me, the only good antivirus application is no antivirus, but I realize that most consumers need some kind of protection from the hostile Internet and often themselves. So a nice compromise is AVG Antivirus Free Edition, which has a really small footprint and doesn’t slow your computer down to the point where your dual-core PC feels like an 80286 computer circa 1982. Best of all, it won’t hold you hostage for another $80 to renew your annual antivirus signature subscription, since this is FREE. If you bought a new computer, be sure to remove all of the demo AV software first. 0 comments : on " Essential (and free) Windows applications "